Godinje is a pretty village the other side of the hill from Virpazar. Almost every house has neat signs on the road advertising their home-produced Vino, Rakija and Med (honey). The owners sit under the shade of a tree on the terrace or on a chair behind a desk laden with bottles eyeing the passing traffic. 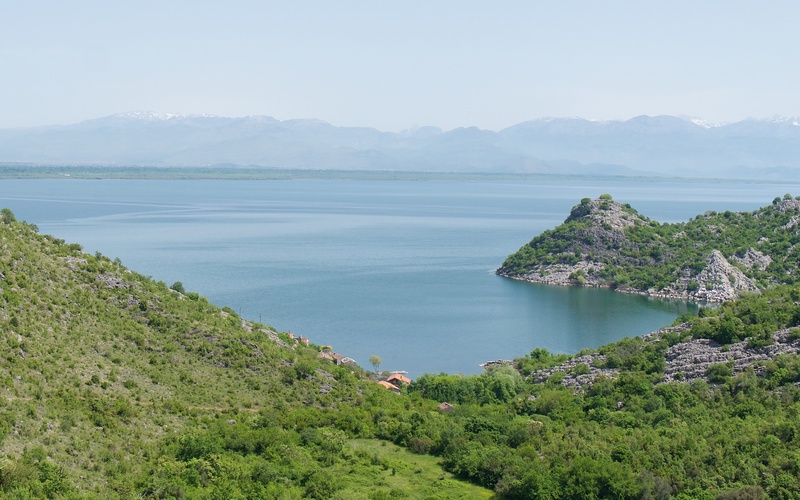 The tourists are at large now in small hire cars but I am not sure that many stop, just drive and park in quiet out of the way place to admire the views of the mountains and lake. The vegetables in the neat plots are a foot high and not a weed in sight; the early potatoes and onions must soon be ready. The grape vines are now fresh green and beginning to take off on the wires. The temperature has been 30 degrees these past few days and now humidity and dark storms close the air. Perfect growing conditions and perfect sitting under the arbour and waiting for a thirsty customer conditions. 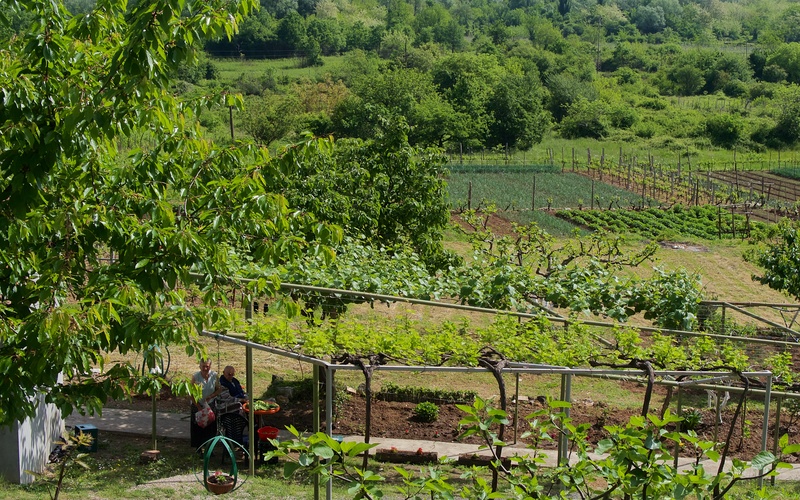 Godinje farmstead offering local produce for sale. There is a quiet corner on the far side of the village of Godinje that holds a good array of butterflies when I check it yesterday. The location, at the base of the valley, is sheltered and east facing and so gets the morning sun; the tall shrub woodland with singing blackbirds, nightingales and blackcaps and a skulking lesser whitethroat is adorned with flowers with attendant hum of bees and large, metallic green beetles. The most exciting is a very large, dark blue butterfly with beautiful white markings that glides past a couple of times and then disappears. This is probably a southern white admiral because, by a process of deduction, this is the only species that occurs here in the Balkans and is on the wing in early May. Not really enough to write about though but enough to come back and have another go. 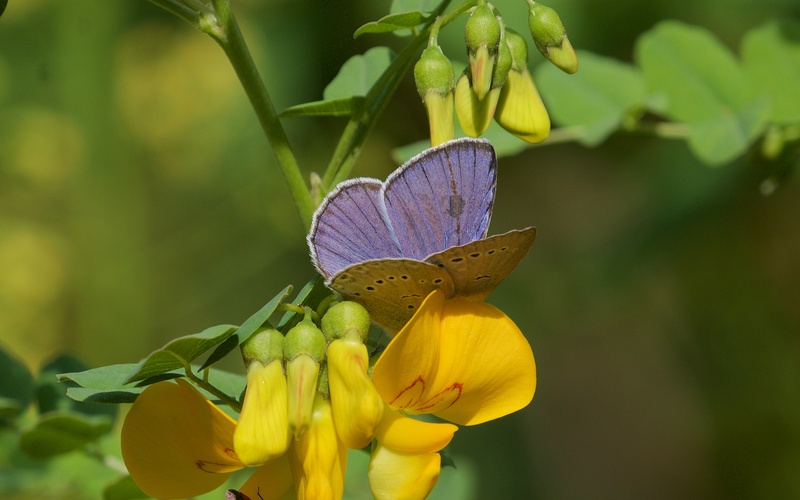 A large blue butterfly then charges into view, circling a bright yellow leguminous shrub and then charges off again. I wait and this happens again. Then it lands on the legume and sits bolt downright. On another occasion it tangles with a darker butterfly that looks slightly smaller. The darker one, presumably a female shivers her wings but the male does not do much except check her out then charge off again. A second male briefly appears from the other direction and then it too bolts. Well the books are in no doubt. This is Iolas blue (Iolana iolas), the largest blue butterfly in Europe. 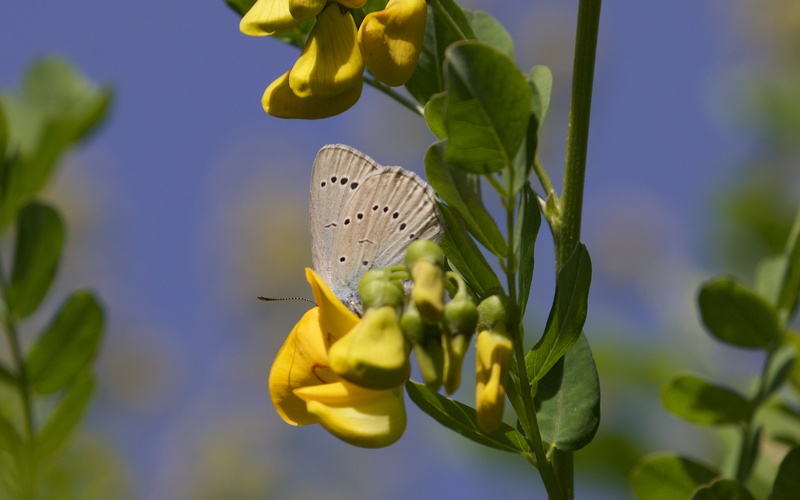 Furthermore, it is a local and difficult species since colonies are small and the butterflies never stay put, always flying off to the next bladder senna (Colutea arborescens) bush which is the larval host plant. 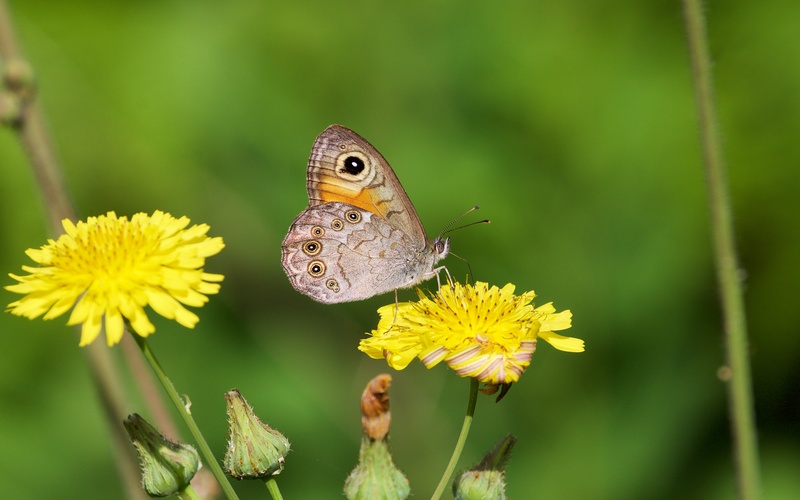 The yellow legume that I parked next to, does not have any large seed pods, the so-called bladders, but it certainly is favoured by these beautiful butterflies. Male Iolas blue on its larval food plant, bladder senna. Around the corner and a grizzled skipper is on the roadside grasses and I see enough to think it is the common grizzled skipper (Pyrgus malvae) but it is brightly marked on the undersides; it tangles with another and I fail to see the uppersides of the wings. 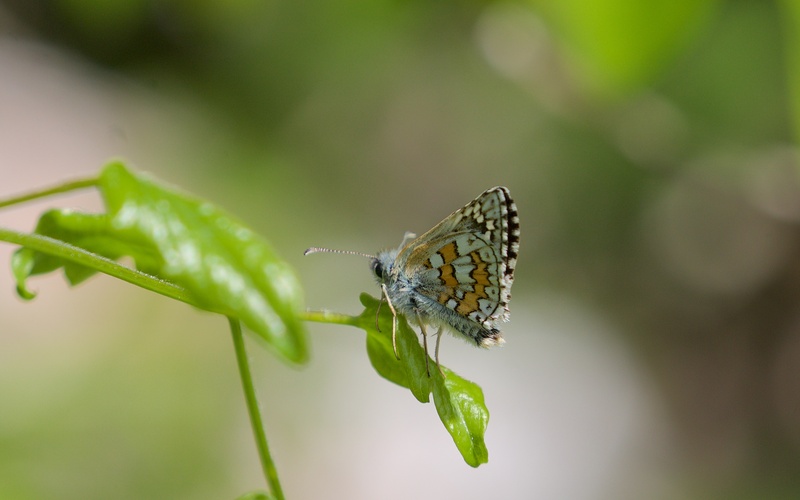 I checked with European butterfly expert Matt Rowlings (see www.eurobutterflies.com) and he put me right; it is yellow-banded skipper (Pyrgus sidae). Common blues (Polyommatus icarus) and chequered blues (Scolitantides orion) are always fluttering around my feet. Chequered is easy to identify with its dark markings but I worry that the commons are perhaps other blue species since they are so hard to distinguish; I look hard at the spots on the underside but none too sure what exactly distinguishes a common from a Chapman’s (Polyommatus thersites) for example. Orange tips (Anthocharis cardamines) and a scarce swallowtail (Iphiclides podlirius) come by but never seem to stop flying but add to the diversity and, up the lane to the long abandoned farm, Glanville fritillaries (Melitaea cinxia) sit in the road and wait for a female to venture by and chase off all comers. Yellow-banded skipper; the underside a dazzling work of modern art. Later in the day, I take the recently cleared footpath to the small fishing village of Radus. The path winds through abandoned terraces and under shade-giving trees. A glass lizard (Pseudopus apodus) munches on a large snail; these odd-looking animals are forever chancing their luck on the roads. I meet a pair of electricians walking up the path carrying their toolboxes; they are tired and hot and they tell me to be careful, since they had just found a nose-horned viper (Vipera ammodytes) by a house in the village. I walk on but it is midday and I climb a short hill and gaze at the village down a long path downhill through the maquis that gives no shade. This is mad dogs and electricians weather and I decide to retreat; on the way back, I find a small Hermann’s tortoise (Testudo hermanni) and a large wall brown butterfly (Lasiommata maera), which does not settle, perhaps sensing my desire to get the walk over. The long walk down the hill to the fishing village of Radus. The next morning is cloudy and thundery and I am not sure that it is the best butterfly weather, but I return to the butterfly corner and wait and see. The sun comes out from the cloud and first up is an obliging large wall brown feeding happily on, I think, tall hawkweeds (Hieracium piloselloides). 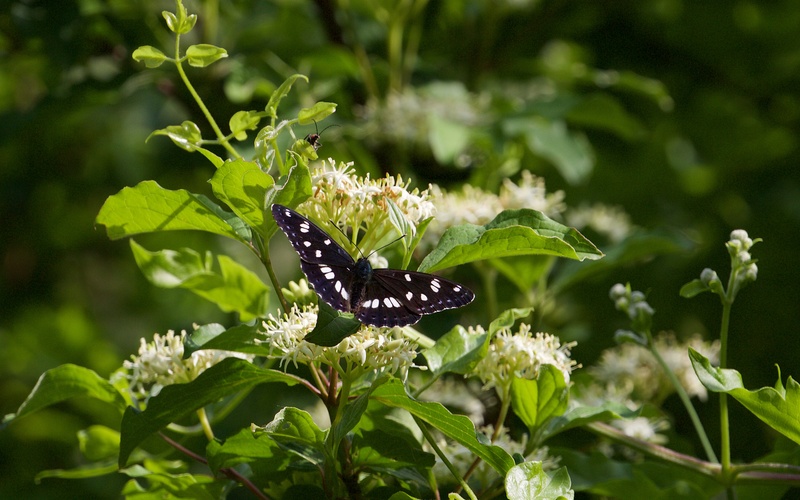 Then a southern white admiral feeds hungrily on the nectar provided by the tall and dense dogwood (Cornus sanguinea) with its coating of white rosettes; it moves to a flower and works each floweret systematically and then moves on. This is a butterfly to see; the deepest, velvet blue like a Knight of the Garter with a strong, gliding flight, and the books say that is quite common in southern Europe. Finally, a male Iolas blue shows up, circles the bladder senna and then settles to feed. I wait and wander and wait; the admiral nearly comes to a flower close by but then up and away to disappear as yesterday. No sightings of the skippers so they need another go sometime soon. 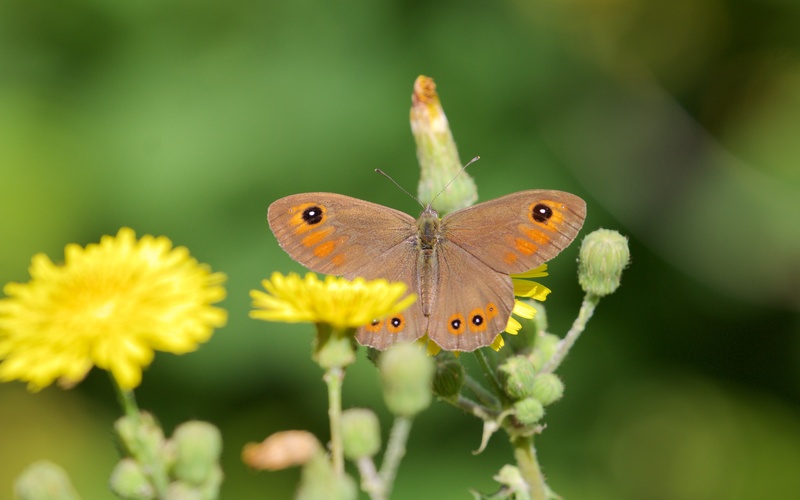 Large wall brown on tall hawkweed. 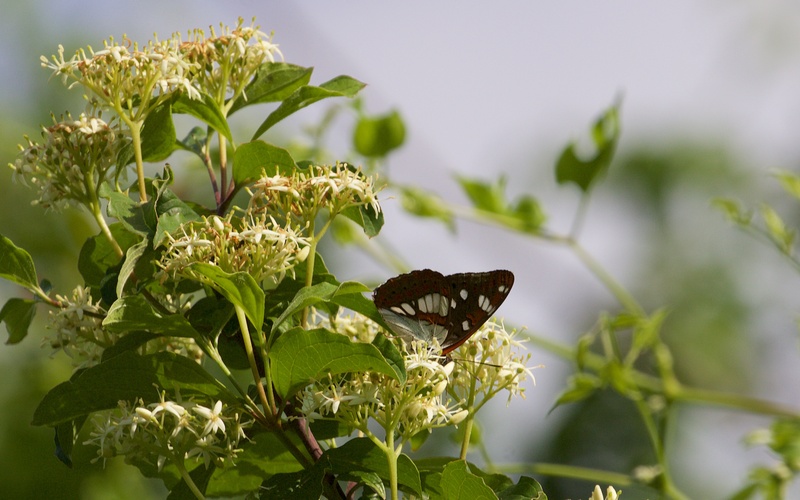 Southern white admiral on dogwood. Just loudly or quietly knocked out by the variety of landscape and flowers and butterfly’s birds you are seeing … It will see appealingly surreal to find yourself back in blighty. These communities just carry on in their old ways … But they are independent perhaps of supermarkets and modern consumption ….. Probably on really low incomes. Though hard life, I hope they do not go too soon to the supposed benefits of a modernizing agenda. You must be really enjoying all the spring abundance. Thanks for all the sharing. Thanks Jan – May is breathtaking in its abundance here and blooming hot. Hello Steve! I’ve decided to read and follow 10 interesting and new blogs a day every day of May 2015, and yours is today’s #1! Feel free to come visit me when you can at http://www.thatssojacob.wordpress.com, and follow if you like what you read. Happy new year and happy blogging! Thanks. I visited your blog and you are a funny guy. All the best.